In this session, Klein focus the discussion in the internal structure and organization of the firm. Ronald Coase in his 1937’s article, referred to the firm as an island of socialism. Klein argues that in a market economy, no matter how large or bureaucratic a firm is, it is still a private organization and its assets are private property, and that Coasean perspective is a metaphor for understanding the ways resources are allocated. Of all of the topics we are discussing in this seminar, what is a firm, why do firms exist, what explains the boundaries of the firms and so for, you might think that questions about the internal structure of the firm are the ones where Austrians would have the most to contribute”. 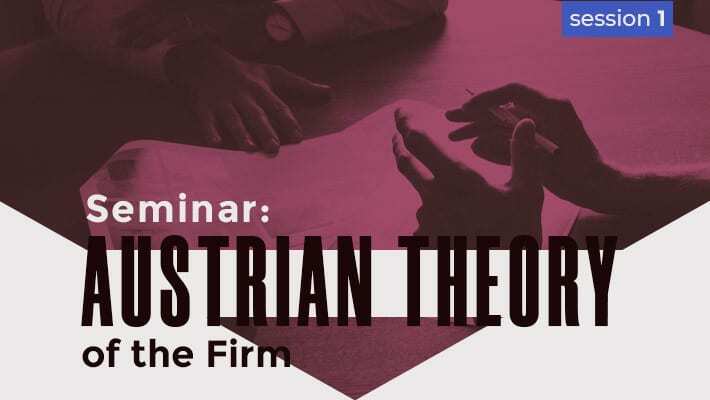 Klein analyzes the reasons of beholding a hierarchical structure in the firm and why does a spontaneous order within this type of organization may just work in theory. He leads the discussion towards the study of decision rights, decision authority, property rights, incentive problems, authority and commands within a firm, from a Austrian point of view. Think about decision authority as the boss designing the rules of the game and can decide how much discretion can give to the [players]”.